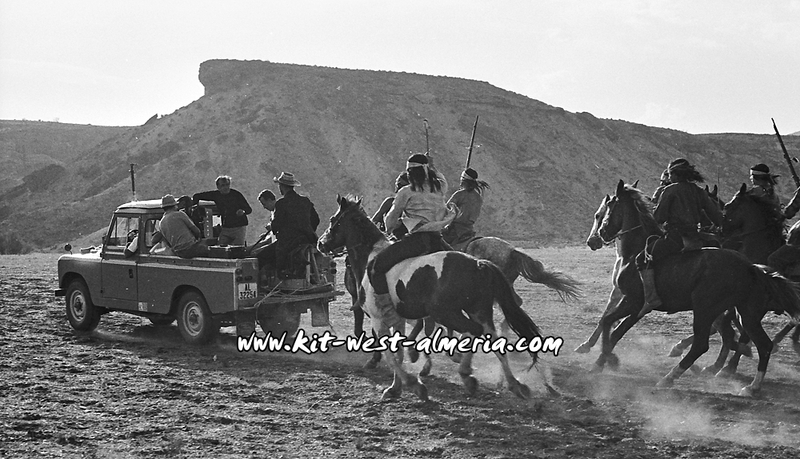 Jaroo (Lee van Cleef) and his Indians ('Santana'-Iron Eyes Cody) 'rushing a horse-drawn carriage to death'. 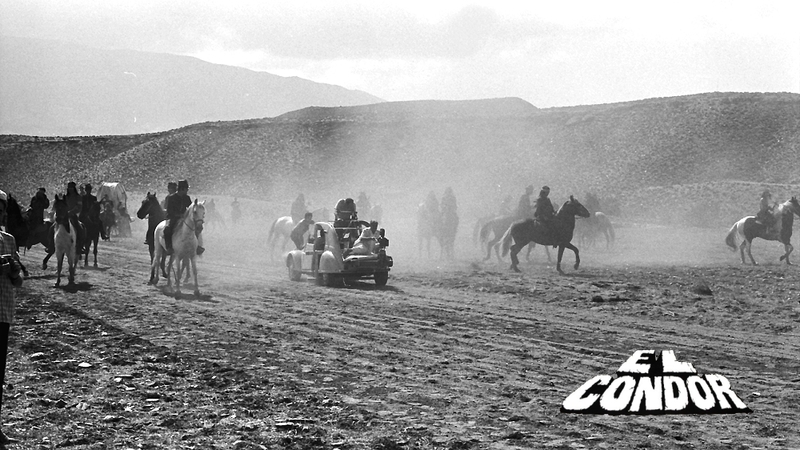 Nothing happened to the horses, but the coach is not doing well. Jaroo: "I have to keep Santana busy!". 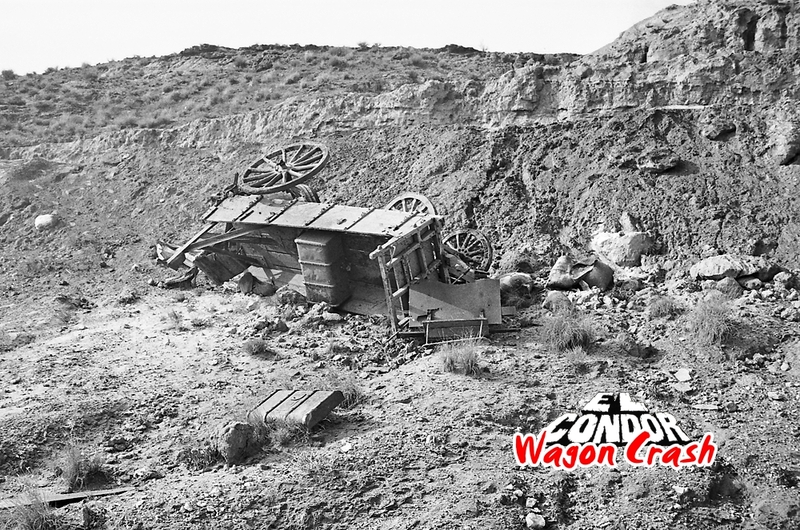 This is the story of a noble wagon and his untimely end. Planned and prepared by the SPFX Crew (Kit West) and many fearless stuntmen (Tap Canutt). 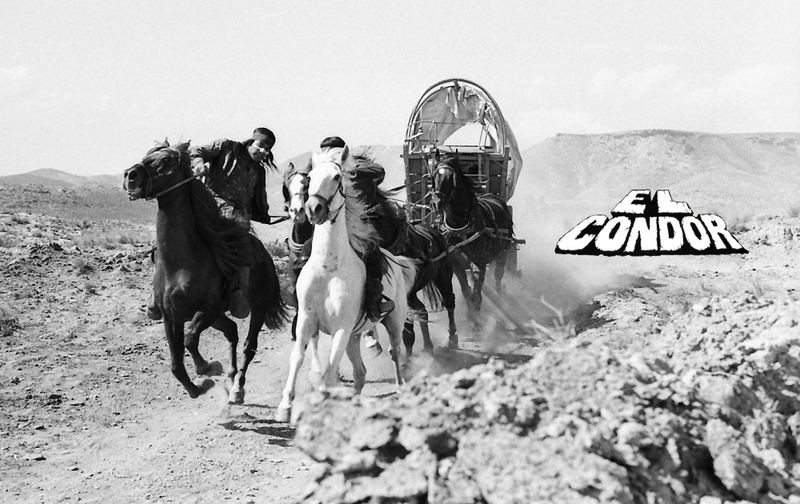 It is also the story of Lee Van Cleef's favorite horse - Olivia, the Land Rover. 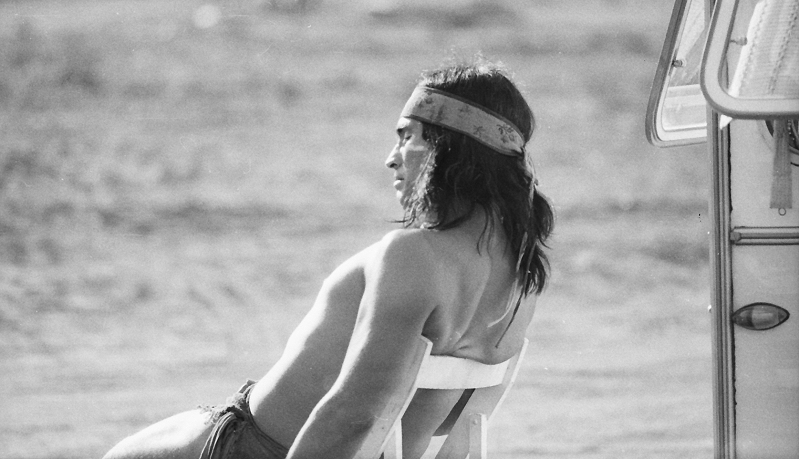 Special Effects Supervisor Kit West during a break - Valle del Buho, 1969. 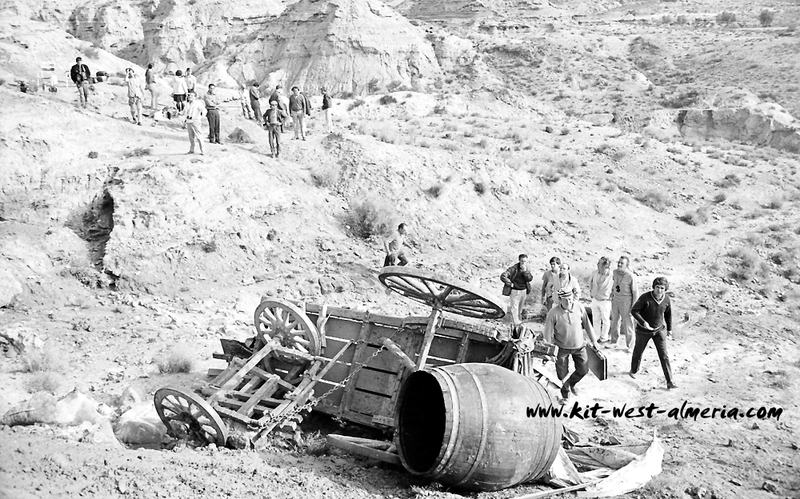 The 'wagon crash' scene was filmed in the Valle del Buho (Tabernas, Almeria) and in the surrounding Ramblas. 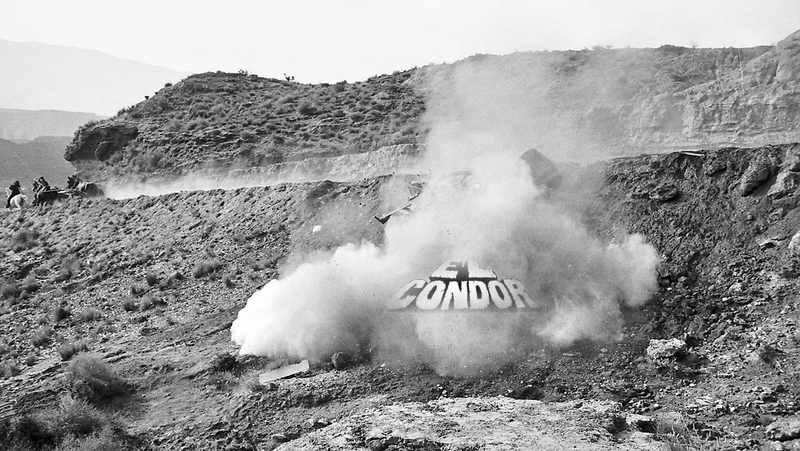 It all started near the Fortress 'El Condor'. I would like to draw your attention to the Land Rover in the background. Look at the small construction on the back of the Land Rover. 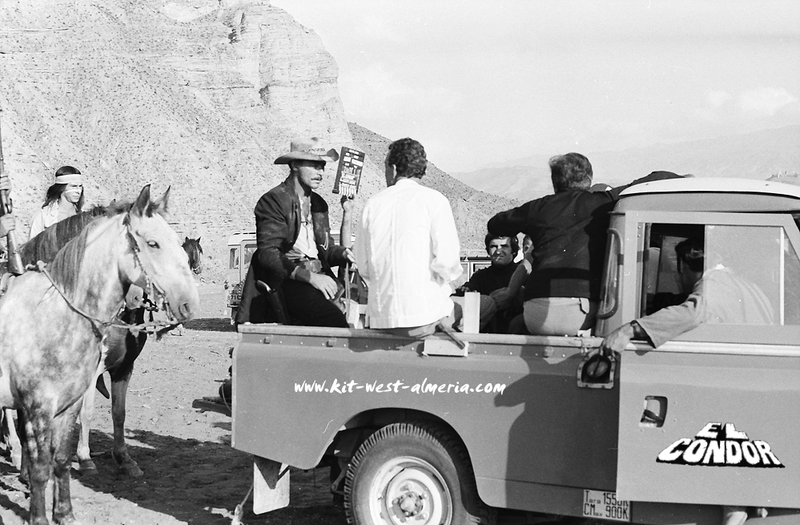 The Land Rover is specially prepared, saddled for Lee van Cleef! First test shots with the special horse. 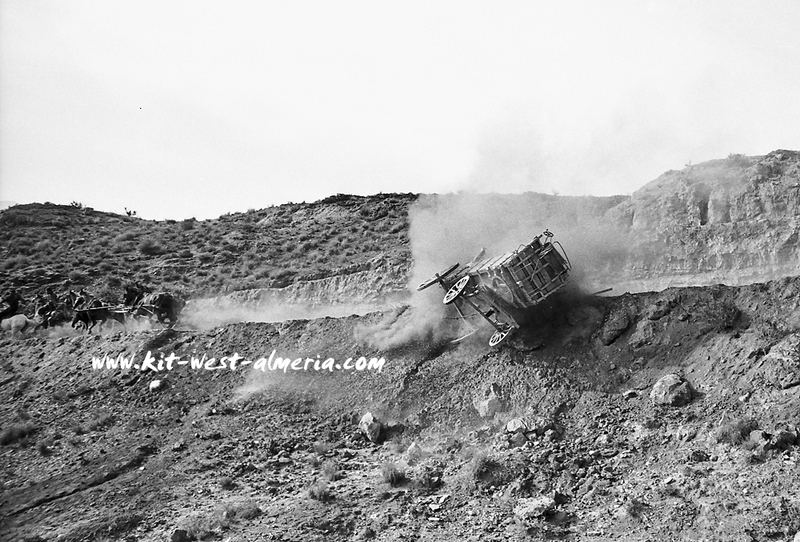 A wild ride through the prairie of 'el Buho'. 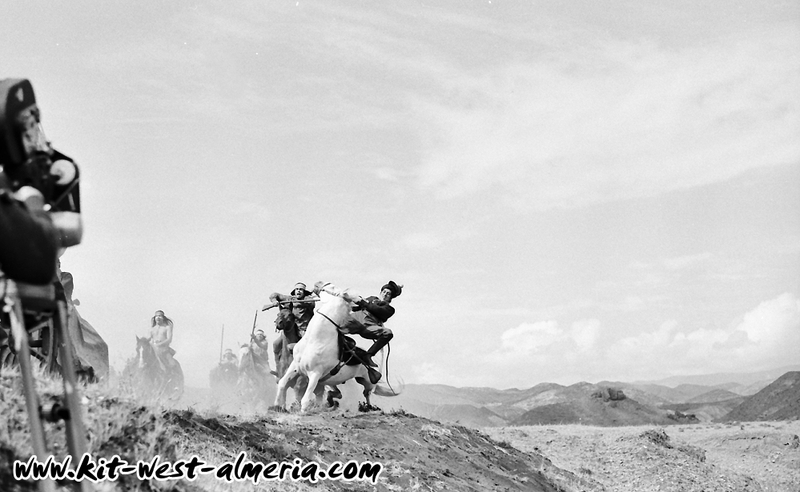 This crazy but great idea was necessary because Lee, due to an injury, could not perfom any wild gallop scenes. well, you can not pursue a wagon at snail's pace. So what have they done? the sharp rides (in distance). 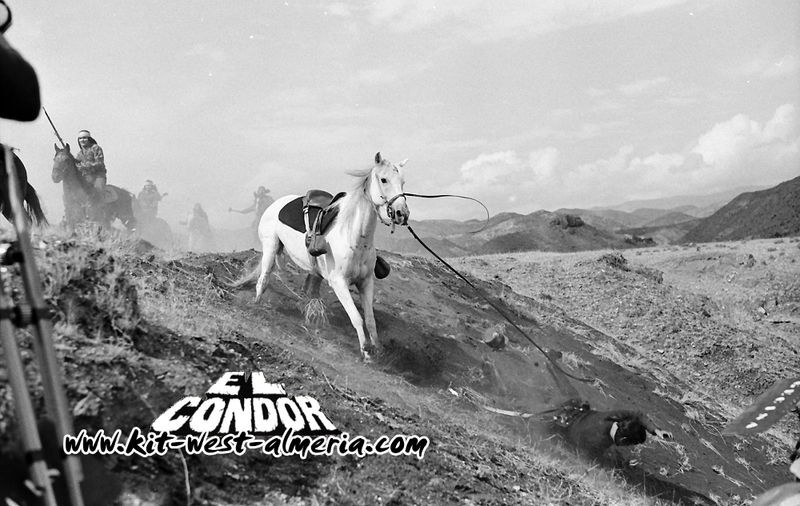 bad man of the west, ...confessed as he tried out his horse, that he really does not trust horses. Ho, ho, ho! 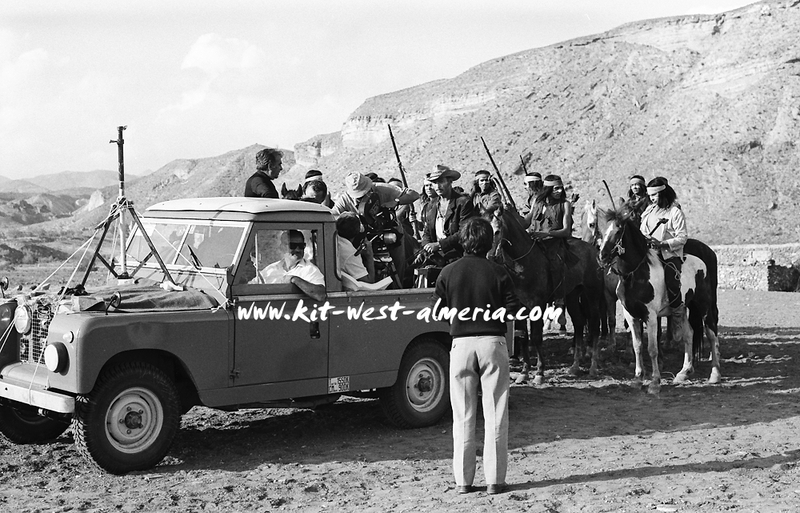 Lee van Cleef riding on a Land Rover. It looks so funny, the whole crew had a grin on his face for sure! Yeeha! 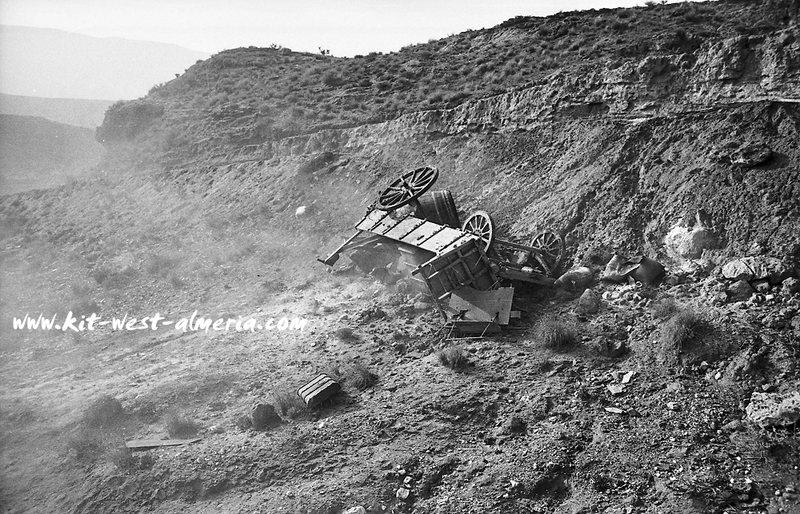 "Yes, Lee was in a car accident after filming 'High Lonesome' with Randolph Scott. 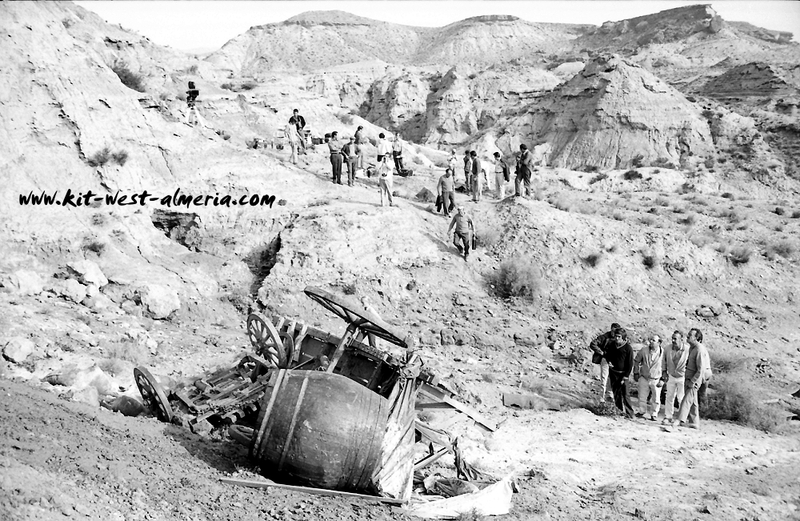 Driving home from Lonepine, California Lee was in a headon car accident. 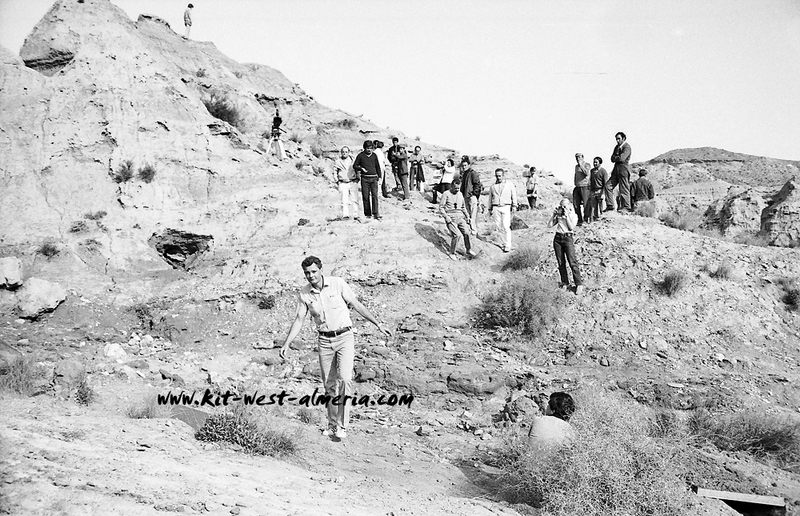 It was in late September 1958. Lee's left arm was broken in two places and his left kneecap was shattered. He was told by doctors he would always walk with a limp and would never ride a horse again. gave him circus horses to ride. They are much gentler on the rider and they look spectauclar. scenes at a distance. Lee was usually seen in close-ups or mounting and dismounting and riding a short distance. Lee could and did ride horses after the accident but apparently it was either difficult or painful for him." 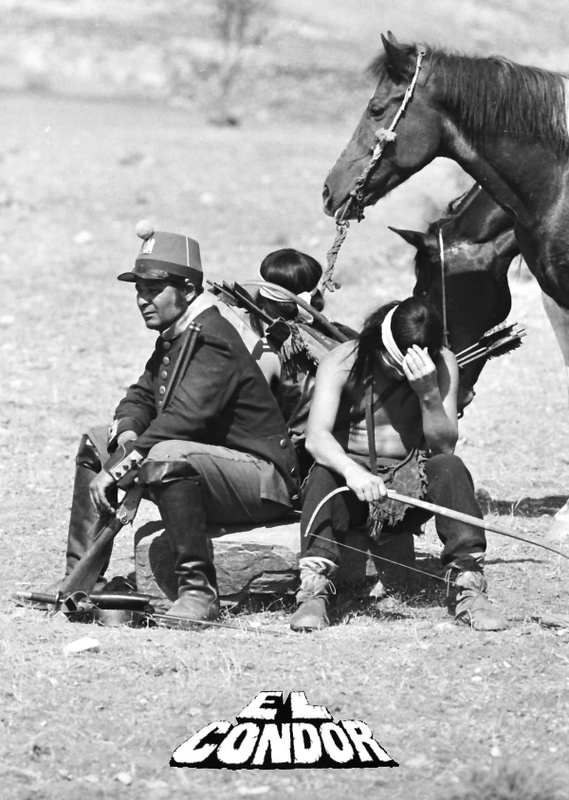 Apaches in the Valle del Buho, 1969 - Spanish Extras. 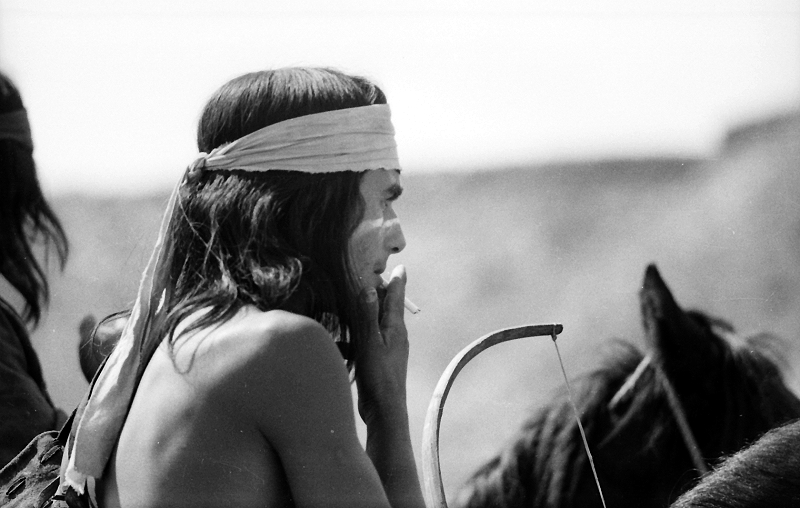 Astonished Apaches should chase a Land Rover - These film people are all crazy. 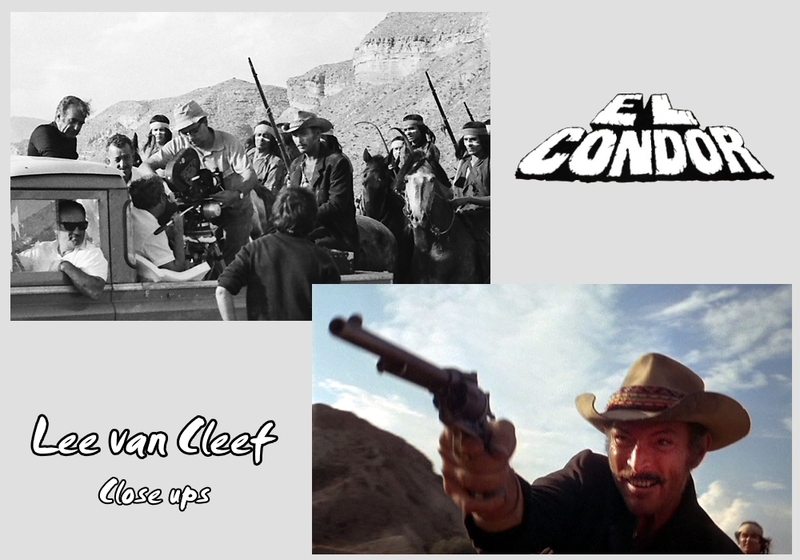 The Land Rover was used to get some good looking close ups of Lee van Cleef. It should look as if he really rides on a horse. He did it! 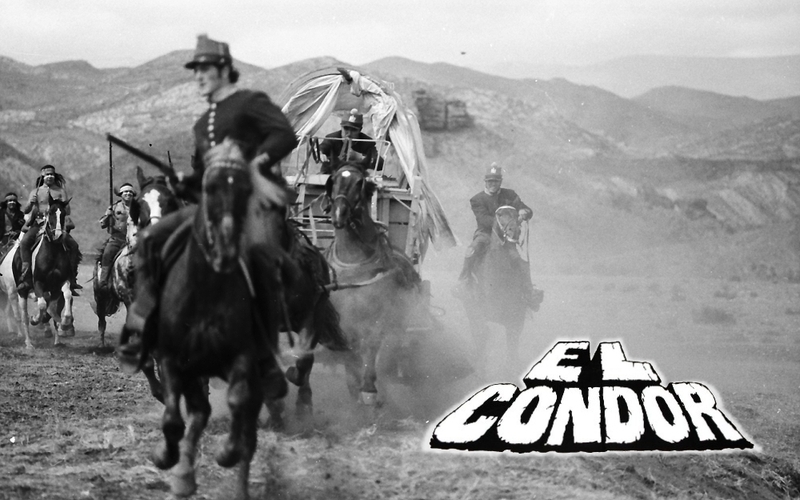 Lee van Cleef galloping through the prairie! 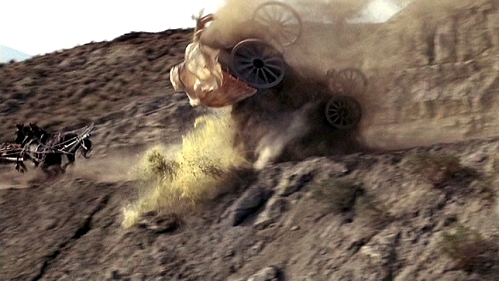 The 'Wagon Crash' scene starts with a chase. In the middle SPFX Supervisor Kit West. The Citroen 2CV serves as a camera car. Stunt Coordinator Tap Canutt is standing in the car directing his Stunt Crew through the chase scene. I have dedicated the '2CV' an own little story. Just click on the 'Citroen 2CV' Button on the mainpage! 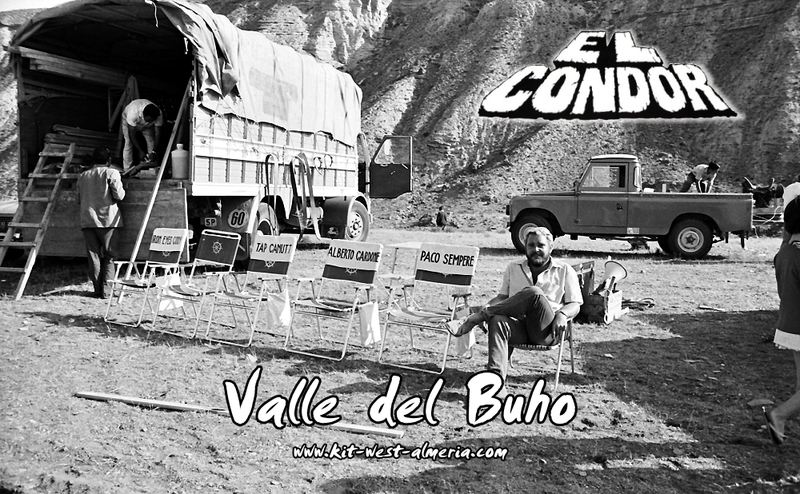 'El Condor' - Valle del Buho, 1969. For these scenes, many extras were used. 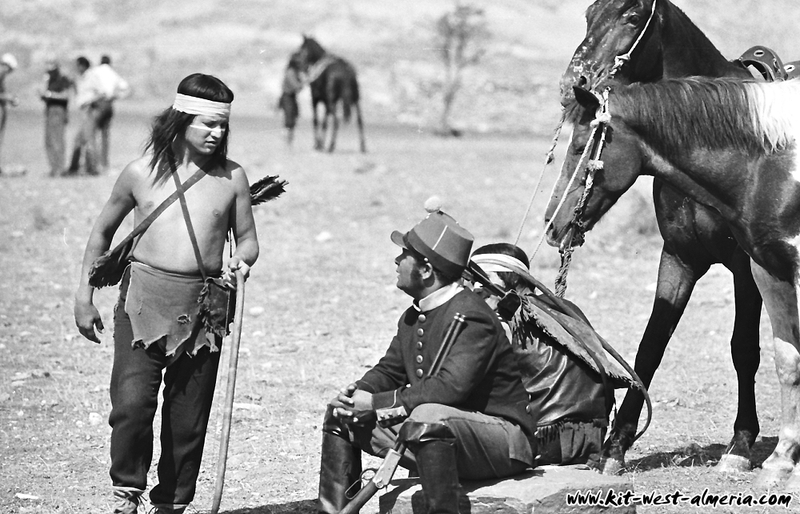 Disguised as Apache or soldier. Who were these people? Who knows their names? 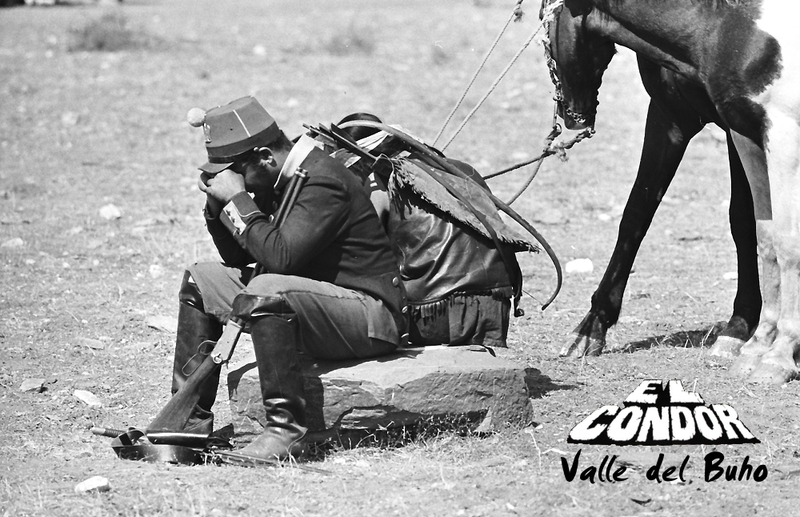 Valle del Buho, 1969 - During a break in filming 'El Condor'. 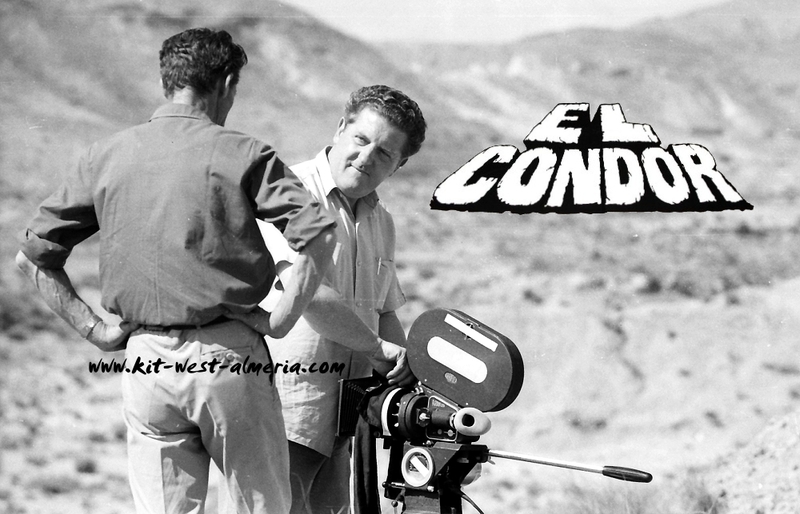 Neighbors from Almeria meet on set. One dressed as a soldier, the other as an Apache. Pal, what are we doing here? - We are in the movie business! What a crazy time! 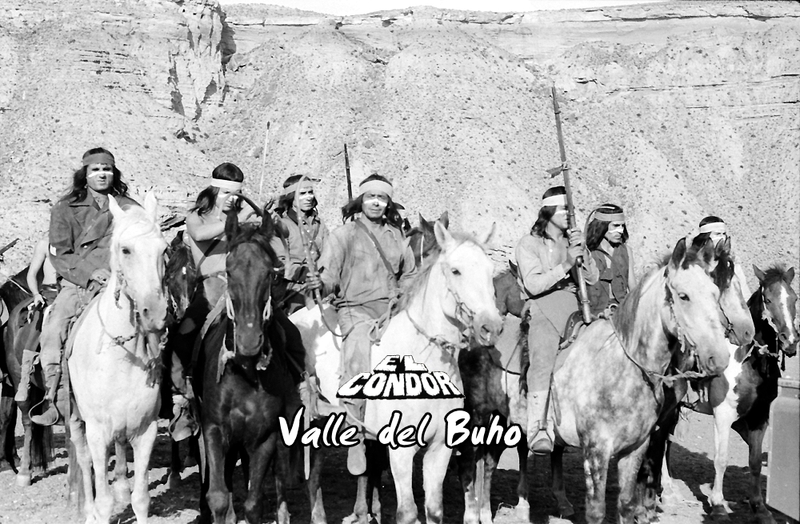 - Valle del Buho, 1969. 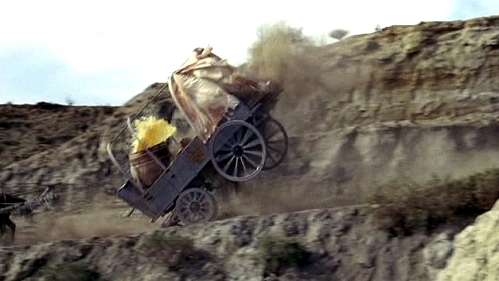 During the chase of the wagon numerous stunts were filmed. 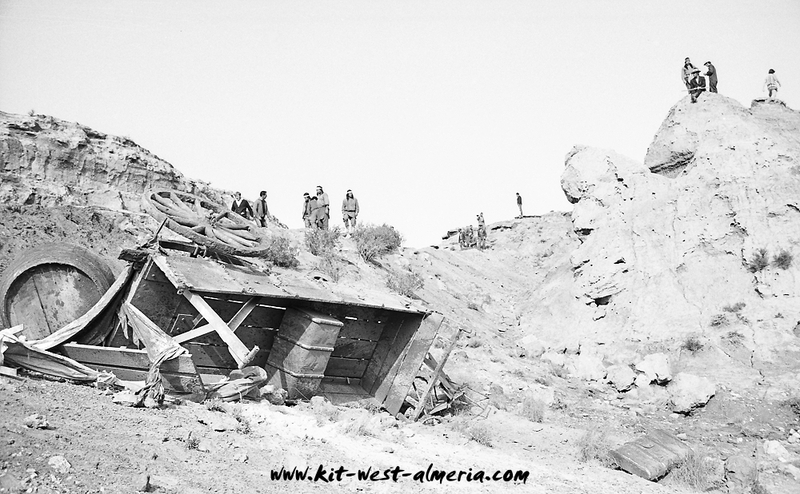 Many dangerous-looking scenes, and at the end, as a highlight, a thrilling wagon crash scene. 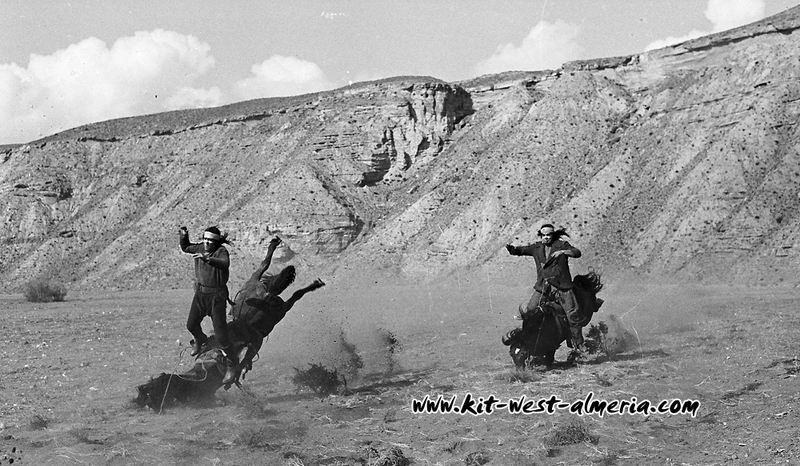 A soldier (stuntman) was shot ... and falls off his horse. Another one bites the dust! Great photo! Kit: "The stuntmen and horsefall guys were always responsible for preparing the ground they were to fall on." Kit: "We had extra camera crew guys in for the day to cover all the stunts." Uuuhh, this soldier is in trouble! ...and there he flies! Hope he has prepared his landing zone perfectly! 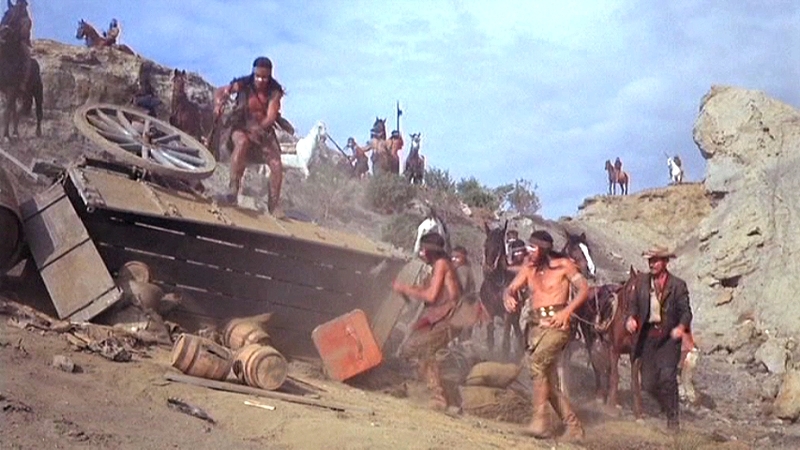 The Apaches are trying to stop the wagon. If you look closely you might recognize a camera. We are approaching the grand finale! Kit, how did you manage that the crash happened at exactly this spot? 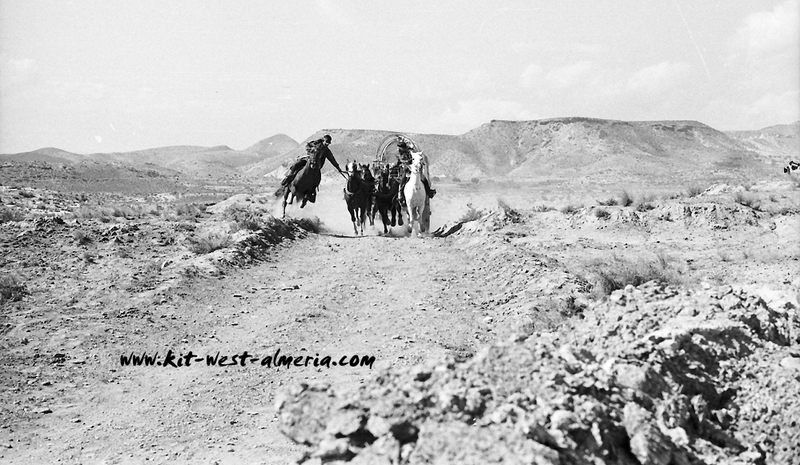 father had developed during his many years on westerns, back in the States. constructed in my workshop, before taking to the location. the wagon tips over the side of the path, taking the horses with it. 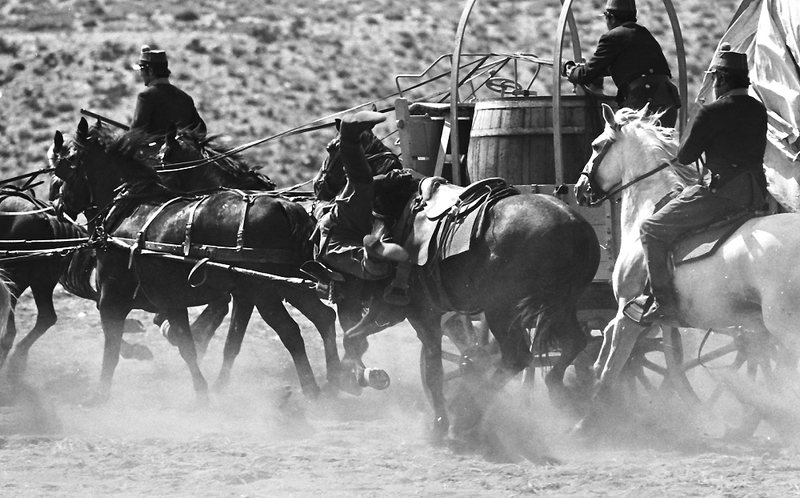 with the horses, and the wagon, which is released by a cable activated quick release. spring which 'jackknifes' the front two wheels, thus tipping the waggon 'head over heels'. All this can be calculated to the one spot the whole gag takes place." View into the SPFX 'magic hall'. The workshop of FX Supervisor Kit West and his Special Effects Crew. 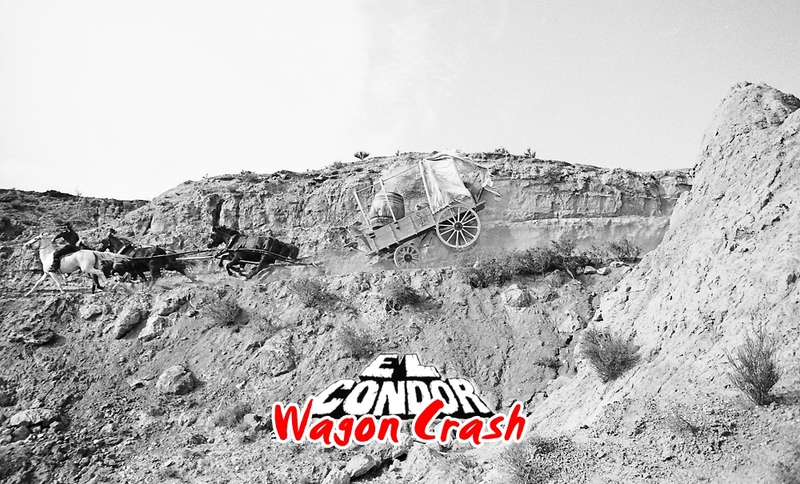 The wagon is beeing prepared for the 'wagon crash' scene. the place of the newspaper 'LA VOZ DE ALMERIA'. 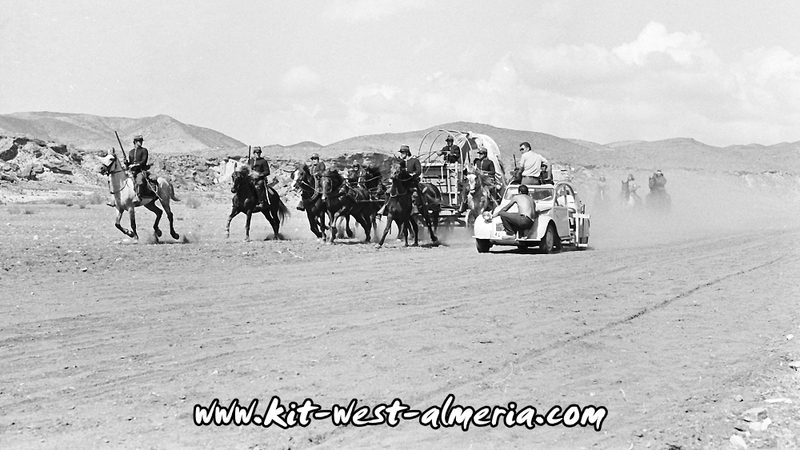 The team of horses are free, everything worked fine! 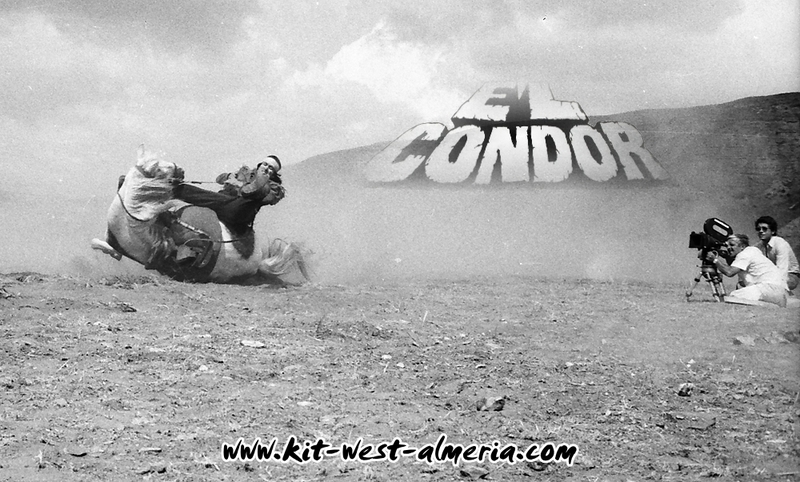 'El Condor' - The end of a chase, 1969. The wagon is only scrap! 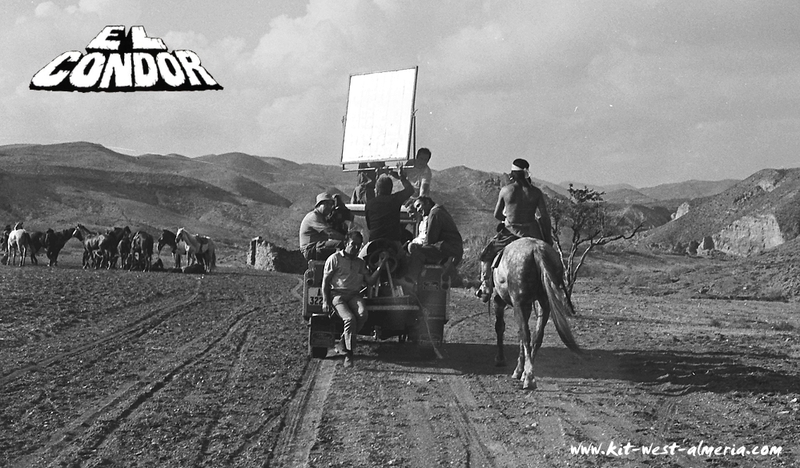 Now its time for the Set Decoration Crew to prepare the wagon for the new scenes. After the Set Decoration crew has been working on it, the wagon looks much better. 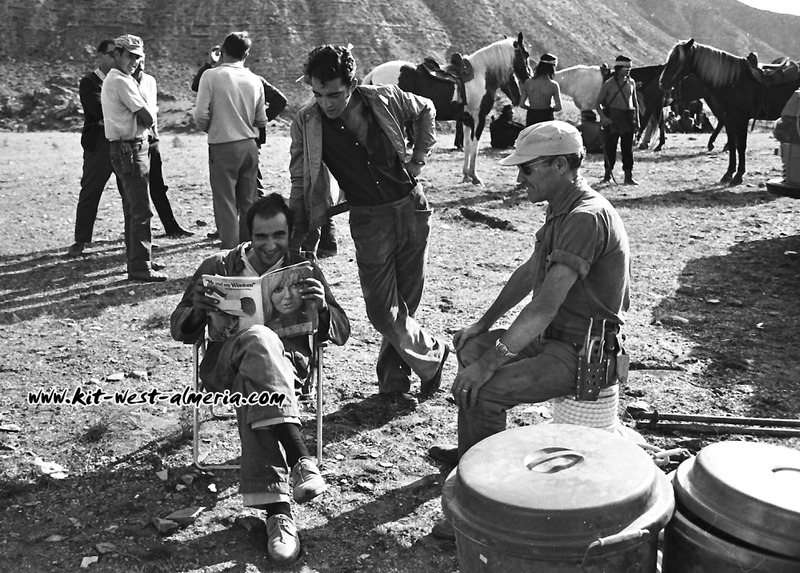 Stunt Director Tap Canutt (white shirt) makes a satisfied impression. Peter Dawson (SPFX) looks at the lying around small parts (the third from the left!). 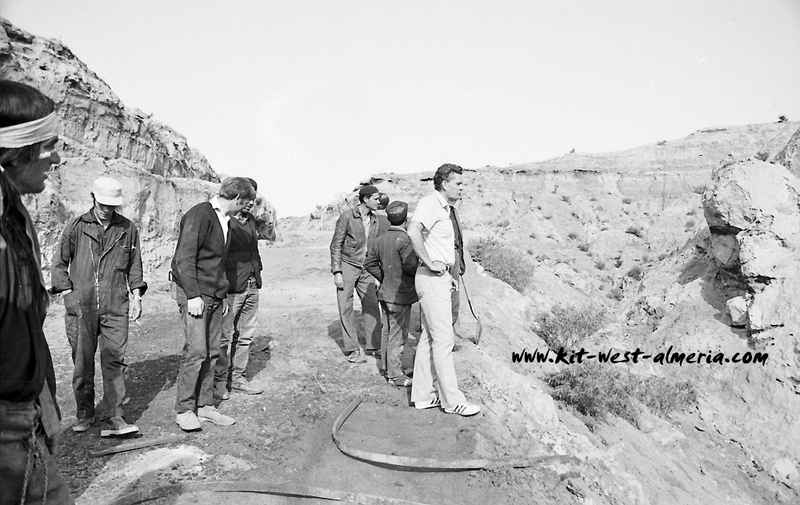 Stunt Director Tap Canutt (white shirt), 1969. SPECIAL EFFECTS SUPERVISORS in UK (NICK ALLDER)!" FX Carpenter 'Choppo' comes with his suitcase (tools) to prepare the wagon for close ups. From this side it looks actually still pretty good. 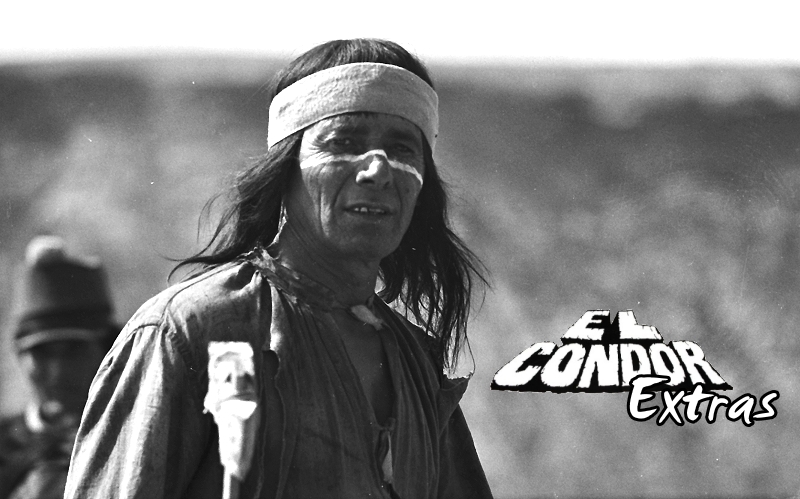 'El Condor', 1969. 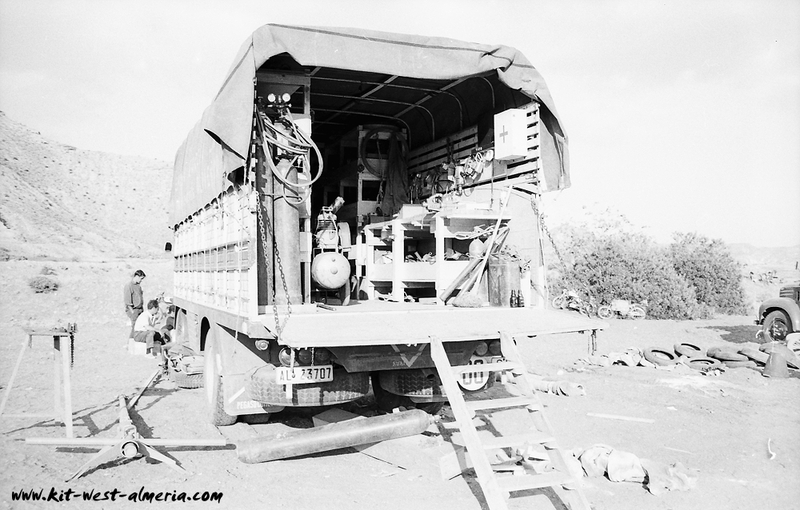 SPFX Supervisor Kit West had his own 'mobile workshop' on set, a Commer Van. See my special Story here: 'Mobile Workshop'. 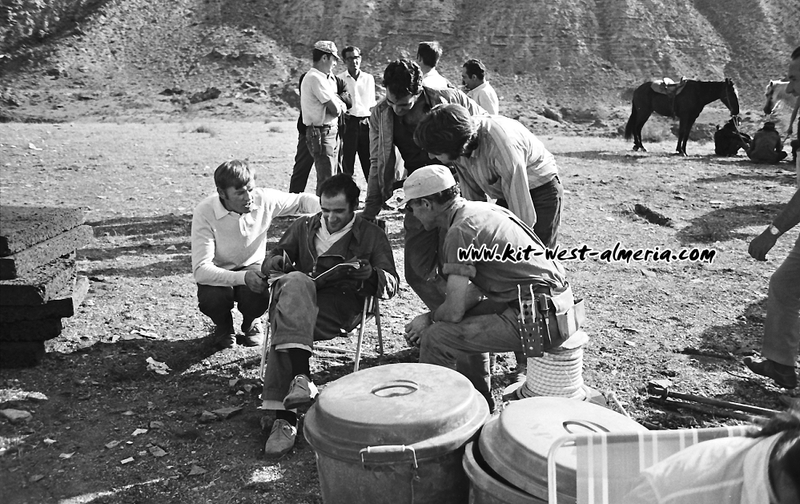 Crew guys during a break in filming 'El Condor', 1969. It seems to be an interesting article ... Peter Dawson (SPFX) wants to know what's going on. What's that on the left side? are used on FX explosions." See more about the FX explosions here: 'Rain of Cork'. 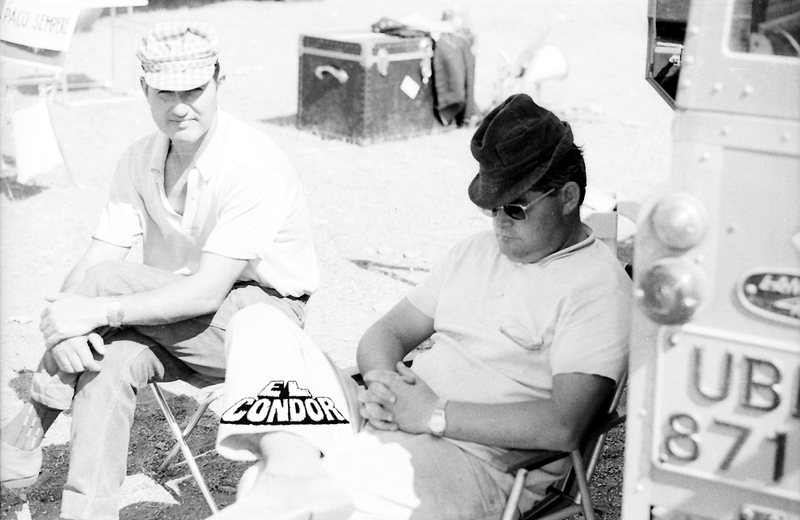 Antonio Bueno (SPFX) and Jack Wallis (SPFX) take a break. and ride to the Fortress. Here is my story on the surprising rain: 'FX Explosions'.